Though the species of sharks that are encountered during pelagic longline tuna fishing can depend on your location and the time of year, here we describe some of the most commonly seen sharks. 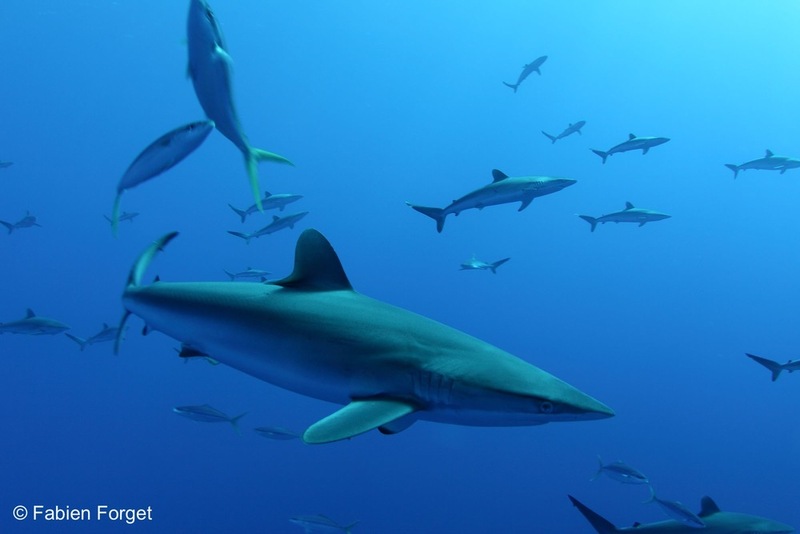 Silky Shark: A smooth brownish body, with a white underside. The pectoral (side) fins are much closer to the head than the dorsal (top) fin, which has a spine at its base. A ridge runs from the dorsal fin to the tail. The underside of the otherwise white pectoral fins has a dark gray tip. 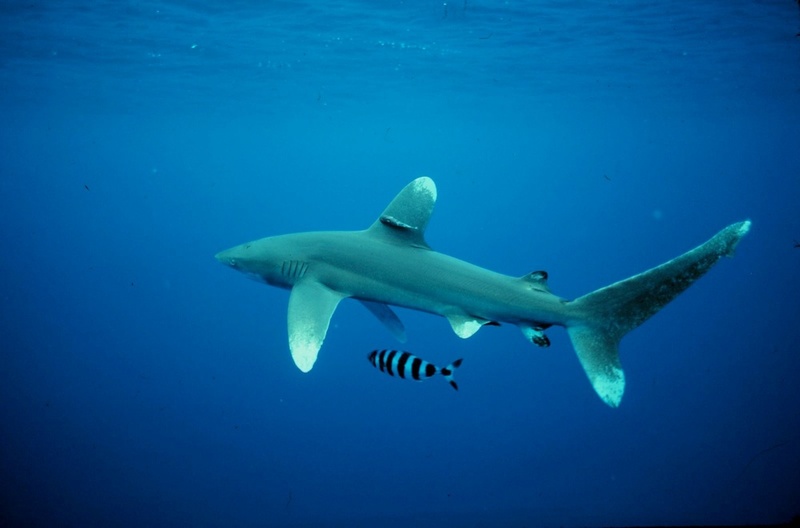 Oceanic Whitetip Shark: Large and rounded dorsal (top) and pectoral (side) fins that are white at the tips. It can have black marks on the ends of its other fins. Its head looks flattened, with a rounded snout. The body is mostly brown with a white underbelly. Shortfin Mako Shark: A pointed, cone-shaped snout with long gill slits behind the head. The teeth are long and exposed, without serrations. The body is a dark, deep blue on the back, with a white belly. The pectoral fins are shorter than the head is long. There is also a longfin mako, and its pectoral fins are as long or longer than the length of its head. Blue Shark: The blue shark has a long, slender, soft-looking body, with a long and pointy snout. The top of its body is a deep and pearly blue that fades to white on its sides. Common Thresher Shark: This is the largest and most common of the three thresher shark species, having a length up to 6 m (20 ft), though half of that length is composed of the long upper section of the tail fin. With a streamlined body and short pointed snout, the common thresher resembles (and is often confused with) the pelagic thresher. 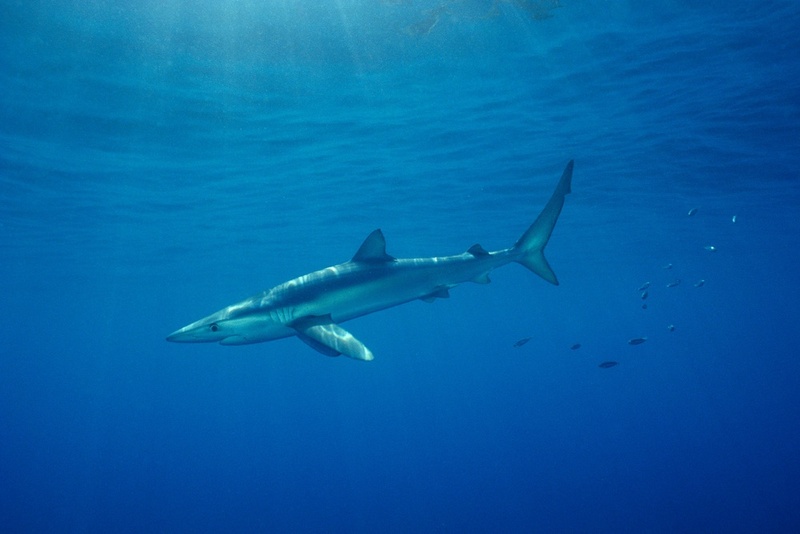 The common thresher’s white belly extends in a band over the bases of its pointed pectoral (side) fins, while the pelagic thresher has a dark blue-gray color at the base of its pectoral fins. Pelagic Thresher Shark: Though similar in appearance to the common thresher, the pelagic thresher is smaller (3 m/10 ft). The body is an intense dark blue above and white below; the white does not extend above the pectoral fins. This color rapidly fades to gray after death. 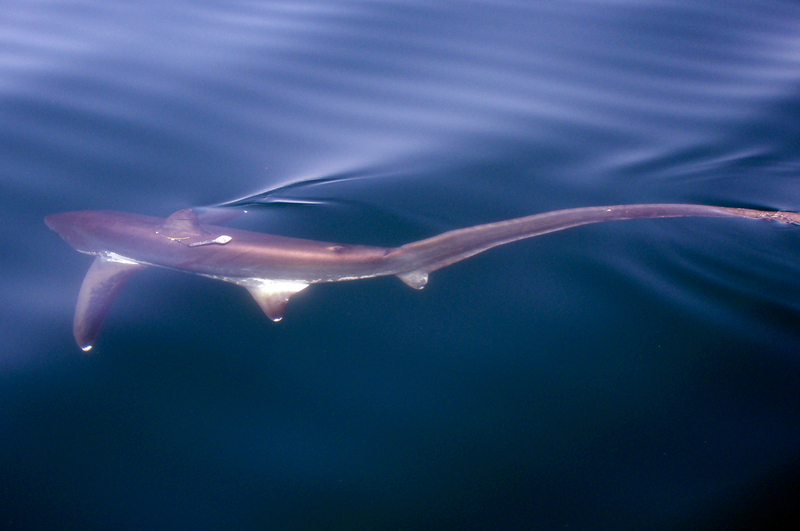 The dark coloring above the pectoral fins and the rounded pectoral fin tips distinguish this shark from the common thresher. Bigeye Thresher Shark: The body looks similar to the pelagic thresher, though the bigeye thresher’s upper tailfin is not as long. Unlike the pelagic thresher however, the bigeye has an unusual groove that runs from the top of the head to above the pectoral fins and its prominent eye socket extends to the top of the head.